A few passing clouds. Low 72F. Winds SSE at 10 to 15 mph..
A few passing clouds. Low 72F. Winds SSE at 10 to 15 mph. Carol Schmuhl, who was a concert violinist, has transitioned to playing the fiddle and blue grass. She is part of the Southwind Bluegrass Band. Bass player Larry Salvatore plays a tune. Members of the Southwind Bluegrass Band (from left to right): Larry Salvatore, Brian Hartlieb, Jim Reece, Bob Barrette, and Carol Schmuhl perform at the scenic park. At right: Jeff Mandeville taps his hands as he keeps a beat with the rhythm of the Southwind Bluegrass Band. Brian Hartlieb’s hand is blurred as he plays the guitar. At left: Members of the Southwind Bluegrass Band, left to right, Carol Schmuhl, Bob Barrett, Jim Reece, Brian Hartlieb, and Larry Salvatore perform. Bob Barrett, left, and Jim Reece tune their instruments prior to their performance. The Southwind Bluegrass Band played at the recent Bluegrass Saturday series. 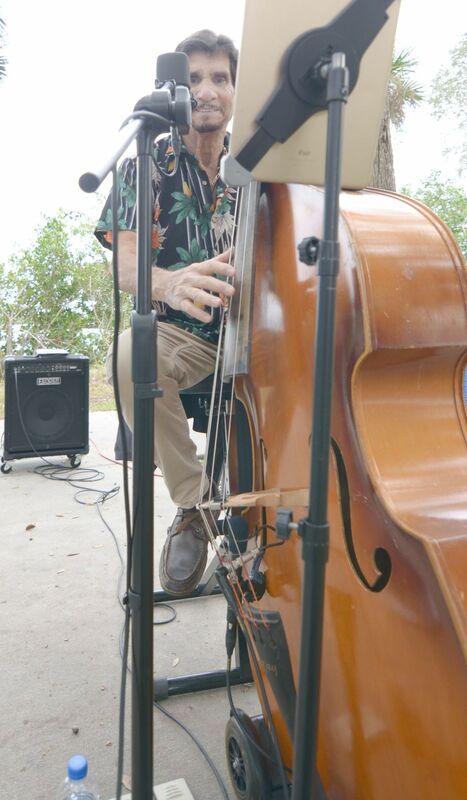 Monthly Bluegrass Saturday concerts showcase local and regional Bluegrass bands at the Harbor Heights Park, 27420 Voyageur Drive, Punta Gorda, every third Saturday of the month from December to March. Bear Hill Bluegrass Band is scheduled to perform at the next Bluegrass Saturday at 2 p.m. on Jan. 19. A $5 donation is requested along with one canned-good for the local food bank. Bluegrass Saturday takes place outdoors in a tree shaded area. Bring lawn chairs for seating.